The Moving Pictures Experts Group, or MPEG, is the body responsible for the standards that we often use for video encoding. MPEG2 is the standard that was created to encode high quality videos, meant to be used for the, then emerging, DVD media. MPEG4 was developed much later, as an encoding method for devices with limited resources. Portable devices, like media players and mobile phones, use this format, as well as online stores who provide the hiring of video and audio files. MPEG4 is the preferred format for devices, as it yields a file that is under 1G for most full length movies. This is a far cry from MPEG2, which can only produce files with five times the size. Storing MPEG2 files will not be a problem on DVDs, as the usual DVD capacity is over 4GB, but is a major issue with portable devices. MPEG4 also made it practical to buy and download videos online, as MPEG2 videos are quite large, and take a long time to download. The small file size of MPEG4 files directly translates to a lower bandwidth needed, when streaming recorded or real-time videos through the internet. Setting file size aside when considering the better format, MPEG2 wins hands-down, as it provides a far superior image quality. The difference in quality is minor when viewing the files through a tiny screen, like those installed in mobile phones and even netbooks, but when it comes to large displays, like most current HDTV displays, you can clearly notice the difference in the final picture. We can attribute this to the amount of data lost, since both MPEG2 and MPEG4 are compression methods that lose data. MPEG4 simply discards more information, which results in poorer picture. MPEG2 compresses the video by discarding the information in portions of the image that do not change from one frame to another, and saving only the portions of the image where new information is added. The MPEG4 compression mechanism is a bit more complicated compared to that of MPEG2, as it needs better algorithms to scan and determine which pixels can be discarded, to reduce the data even further. 1. 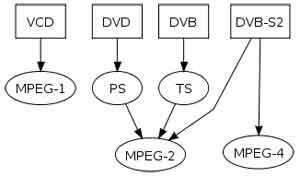 MPEG2 is the encoding method for DVDs, while MPEG4 is the encoding method of choice for portable devices and online use. 2. MPEG2 encoded video files are much bigger compared to MPEG4. 3. MPEG2 requires a lot more bandwidth for streaming compared to MPEG4. 4. MPEG2 produces the best video quality compared to MPEG4. 5. MPEG2’s compression is much simpler compared to MPEG4. Ben Joan. "Difference Between MPEG2 and MPEG4." DifferenceBetween.net. June 22, 2017 < http://www.differencebetween.net/technology/difference-between-mpeg2-and-mpeg4/ >. This article provides false information. MPEG4 was not developed for encoding method for devices with limited resources, it was developed for use with any devices. MPEG4 with appropriate codec will be better for any purpose (portable and HDTV media alike), providing higher quality for much lower bitrate. “MPEG2 wins hands-down, as it provides a far superior image quality.. HDTV displays, you can clearly notice the difference in the final picture” – completely false. Encode with the same settings and MPEG4 will be better for less size. The cost of MPEG4 compression is complexity and processing time, not the picture quality which is better compared to MPEG2. Strictly speaking, MPEG4 and MPEG2 are just containers, and H.264 transport stream can be incorporated inside MPEG2 providing the same quality as MPEG4 with size overhead. mp4 has a higher quality. MP4 is the backbone for cellphone videos and b-rays. very scalable. mmm… i think i don´t understand some responses..
if it compresses more it give you less… am i wrong? MPEG4 uses a more sophisticated compression algorithm. There is more “science” involved in the compression to MPEG4, which takes account of the fact that the human vision system is not perfect and in fact does not itself process huge amounts of data. Therefore MPEG4 does a better job of “discarding” information that isn’t required to give a picture that the human vision system sees as perfect. It is rather similar to the difference between raw audio and MP3. MP3 discards a lot of data you simply don’t need because the human ear is not perfect – consequently MP3 takes a lot less file space but you can’t usually hear the difference. If it compresses more it gives you more, because you can target the same size as old technology and get better picture, or you can target less size and still get the same quality. The poor quality picture you may see with some MP4 is just because people compressing it to the edge. Still you will get better quality than mpeg2 for half or less than mpeg2 file size. It’s people choice to encode it to lower quality, not codec fault. Yes, this article is completely wrong, and I encourage the author to update it in order to avoid spreading this wrong information. mpeg-4 makes more efficient use of data than mpeg-2. mpeg-4 can achieve the same quality as mpeg-2, but requires less data to do so. However, for mpeg-4 to achieve this quality, it requires more CPU resource for both encoding and decoding. Not necessarily it requires more CPU on decoding, especially on low profiles. It is important to understand that codec itself does not impose computational complexity, it just defines a contract between encoder and decoder. The contract is designed in such a way that in ~reasonable~ implementation, most complexity will fall on encoder – optimal MV search and so on. Decoding is mostly straightforward, actually comparable to MPEG2. As a corollary, compression quality is completely implementation dependent, with x264 leading the best video quality/compression ratios of all times. Some others, less hardware hungry, giving terrible results and lagging good MPEG2 implementations. There is nothing revolutionary in MP4, but with new H264 features it allows more fine-tuning, hence better compression. Good utilization of this tuning is expensive to compute, with known CPU/GPU algorithms. But it is very suitable for special-purpose hardware, especially on decoding side. As a matter of fact, even cheapest graphic chip-sets come today with hardware H264 decoders. So what’s better for converting DVDs, BDs, and ISOs for streaming to a new Samsung 4K TV?? I’ve tried mp4, but the results are horrible. Saying “I’ve tried mp4 but the results are horrible” is like saying “I’ve tried a computer but it did not work well”. Just to remind, BD itself is mp4. And people are doing smaller BD rips of exceptional quality. I too feel that the author is not correct. My observation is that 1080p videos of some of the current movies in mp4 format on Youtube are of stunning quality while the corresponding DVD videos are no where near. I am a audio and video system designer. I challenge you to do your own test on which picture (Video) is best. Which is better MPEG2 (HD-DVD) or MPEG4 (BLU-RAY). Side by side comparison using the same display (Samsung 4K, UN78HU9000), same movie (300), same HDMI cables (AudioQuest Carbon 2 meter), obvisouly different players (format). Conclusion you will get better picture quality playing movie on the HD-DVD format. Why? MPEG2 uses less compression on HD-DVD format than MPEG4 on BLU-RAY format. (SIDE NOTE: By the way, the only reason why Sony won the format was due to Warner Bros dropping HD-DVD format and the release of the PS3.) Bottom line when you compress video, audio, or anything, you remove information from the mastered original. Thinking logically, when you subtract something from the original, how does that make it better. You want to hear and see high quality audio and video come by any Magnolia Design Center. Not true, any of it. I can prove it. Take your hand and hold it in front of your face. You can see every line and pore, right? Now move it side to side about 12″ so the cycle repeats every second – how much detail do you see now? At this point it might dawn on you that you do not need to transmit a high definition picture every frame. That is why you can discard a lot of information and not even notice. There are many things wrong in your reply. First, regarding HD-DVD, as a video systems designer you should know that HD-DVD supports H.264 (part of MP4), so BLU-RAY vs HD-DVD is completely irrelevant to the discussion, those are just containers. The discussion is about MPEG4 vs MPEG2. Both use quite similar algorithms but H.264 gives more efficient ways to compress, just as an example motion vector resolution. Think logically, H.264 is capable to do exactly the same thing as MPEG2 and just has more options and possibilities to utilize redundancy and controlled loss. If you are video system designer you should know that H.264 supports any range of compression up to lossless. For example MPEG-2 lossless and MPEG-4 lossless would make the same quality picture, equal to original. So your comment about “more compression” is a non-sense, it depends on particular compression parameters. You compared particular instance which was compressed more, so it is comparing oranges to apples. The quality also depends a lot on the encoder, which you even don’t mention. Given the SAME compression level, equal target file size and proper parameters, X.264 encoder will beat any MPEG-2 encoder. Mpeg4 codec gives AT LEAST the same quality as MPEG2 for the same file size. Of course if you use mediocre H.264 encoder and super quality MPEG2 encoder, the results may differ. Compare things of the same level. Please share your email id i have some questions. I can’t see how I can privately share email here (posting it public is not a good idea due to spammers). why not post your questions here so it can be useful for others? I am no expert, but I agree with this. MPEG2 is an older format, and has limited option, both in the encoder and decoder. MPEG was designed to standardize video (encoding) format standards, thus does not encompass the emerging new standards of today. To readily compare MPEG2 to MP4 would be slightly skewed. MP4 contains more (container) option and wider format standards than MPEG2. Also they use different compression algorithms, the only true comparisons would be image quality to file size ratio using same setting for frame size, frame rate, for NTSC or PAL standards. From personal experience I find the MP4 to be visually more pleasant for online streaming, and the image quality is superior not due to MP4 but due to better frame size (1280×720) compared to (720×480), which allows more pixel depth, which yields less video blocking, smoother motion transfers and better color matching. Please make it clear! I used to watch various FTA TV channels through Mpeg2 decoder, since the end of March I don’t access most of them the reason is being said that most stations have shifted from Mpeg2 to Mpeg4! How shall we! Darknight, like you note, the comparison should be done on compressed size / picture quality under the same settings and H264 wins both hands with descent encoder (and now there is H265 which has potential to be almost twice better than H264!). However, this has nothing to do with dimensions because there is no is no such 720 limit in MPEG2. This was the limit of DVD-Video container standard which used MPEG2 as codec but has nothing to do with limits of MPEG2 itself. They use not so different algorithms. Rather, H264 improves and refines similar algorithms. In some sense, MPEG2 is a subset of H264, so of course H264 is superior because it can do at least exactly the same and more. I agreed with you, but my observations were based on the restriction applied for DVD Standards,and not necessarily mpeg2 itself. To be fair most software manufacturers limit there software to supported DVD Standards, to use non-standard mpeg2 on a computer requires licenses and codecs to support the non-standard mpeg2 file. I use Pinnacle Studio Versin 12 and that software only supports standard DVD formats and frame sizes, (720*480, 352^480 for NTSC), even though my capture card can capture (1920*1080), I know that newer version of Pinnale support higher frame sizes but those are direct at Blu-ray and not DVD, since HD-DVD never made the grade, and to create video on DVD which is strict on the formats to allow to play on desktop DVD players. For the internet mpeg2 in it’s large file size makes it a poor choice for streaming, thus MP4 wins. I have mpeg2 files in 1920*1080 and they are gorgeous, but at a 10gb – 12gb file sizes most medium to low end software editing tools just cannot handle, besides my pinnacle studio 12 has major issues supporting mp4 even with licensed codecs installed. hi a bit late for this but my own experience is the same as the original authors I have found MPEG2 to be superior to MPEG4 admittedly it was on a helicopter blades shot where MPEG4 seemed to be interlaced giving only half of the picture very nasty the old venetian blind look..MPEG2 gave full picture of blades ..this is perhaps because MPEG2 was native to the camera sony nx30 which was shot Progressive..how can something shot progressive return as interlaced inFCP? MPEG 4 thats how.. I believed it to be the best as all the above replies agree…but in this case it wasnt in fact far from it. andy, you can encode bad in MPEG2 and you can encode bad in MPEG4. With proper settings, good encoder and same resolution MPEG4 is at least as good as MPEG2 for the same file size. MPEG2 is essentially a subset and you can get exactly the SAME result in MPEG4 as in MPEG2 (and usually with much smaller file). But if it is encoded with different settings or resolution or MP4 is set to use too much compression, what exactly can you compare here? In this case you say it was interlaced, then your comparison makes even less sense. Compare apples to apples, oranges to oranges. Otherwise you can compare good encoded MP4 file and poorly encoded interlaced MP4 file and conclude from this that MPEG4 is much worse than MPEG4 itself. This does not make any sense. This is similar to saying JPEG format is less good than BMP because some BMP picture was clear and JPG was blurred and had blocks. It makes sense to blame the person who put settings for JPG compression or a program that produced it, and not the format, because as a format JPG is capable to do anything that BMP can. People often say MP4 is so worse than MP2 and then it appears they are comparing 5Gb commercial encoder MPEG2 file to a 100Mb file encoded by youtube. MP4 requires more complex and expensive hardware, if there was no reason behind, nobody was using it. Most bluray disks of high quality use MPEG4 AVC because it produces higher quality for the half of storage size. Did you ever see commercial grade bluray with “only half of the picture very nasty the old venetian blind look”? The MPEG4 codec requires more work on the author, because you have a range of compression options dependant on the target device. When you select an automated target (such as clicking to a smart phone), you end up setting certain parameters particular to that device (small resolution and bit-rate). Newer smart phones are a lot more accommodating. The advantage is that you don’t have to fuss about with manual settings as it’s all done literally in one quick, often with automated hardware acceleration (nVidia CUDA/ATI Stream/Intel QuickSync). However it must be said that whilst these options can drastically decrease transcode time, there are still underlying quality issues. So to cut a long story short MPEG2 being more limited means it’s much easier to work with in terms of what you play it on. In contrast MPEG4 or H.264 has a lot more variance because it can be tailored to play on anything from a crap smart-phone to a Blu-ray player. The trick is knowing your requirements: if you’re happy with playing it only on your phone then go for it – but if this is your ONLY copy of your family recording, then don’t discard the original. If you want at least the same quality as the original then you need to make sure you have the right quality settings. You will probably find that newer smart-phones despite their small screens, can actually play the higher-quality modes. These devices also do the decoding in hardware (the GPU), so CPU hogging isn’t an issue. So yes, MP4 can be just as good as MPEG2 as long as you know what you want out of it.